Congratulations, baseball fans. You did it. You successfully navigated the miserable winter months. Spring has arrived. And, save for a flurry of offseason moves and meaningless spring training games, you’ve been deprived of the game you love. But the wait is over. Thankfully, for those of us in Kansas City, the offseason went by much faster this year due to it being one month shorter than it has been the previous 29 years. Still, it’s good to have baseball back. Before I make my predictions for the 2015 season, let me quickly point out how wildly successful my 2014 predictions were. I, along with everyone else who predicted these things, whiffed on the AL East. I missed on the Pirates too, and made the mistake of picking against the A’s. But 7/10 ain’t bad. So here we go. Let’s look into the future together. Postseason picks in italics. I’ve added ALCS/NLCS/WS/MVP/Cy Young winners this year too. Another year of uncertainty in the AL East. The Red Sox reloaded adding Pablo Sandoval and Hanley Ramirez. The Yankees did nothing and appear fragile. The Blue Jays added Josh Donaldson but are young and lack a rotation. The Orioles were predicted to stink it up last year but ran away with the division and are likely under projected in 2015. The Rays are a dark horse as always. Typically I refuse to buy into teams that spend tons of money to restock their teams. I think it takes a year to gel as a unit and establish an identity. However, the Red Sox rotation is already strong and on paper this is the best team in the division. Look for Mookie Betts to break out this year too. Another wide open division, and one where I am obviously biased. The Indians return basically the same team but their defense is terrible. The Tigers added Yoenis Cespedes but lost Max Scherzer, and now Verlander is injured. The Royals are defending AL Champs and have lots of swagger, lost Billy Butler, James Shields and Nori Aoki but added Kendrys Morales, Alex Rios, Edinson Volquez and Kris Medlen. The White Sox had perhaps the best offseason of any AL team. The Twins will not contend. But I’m picking my hometown boys. People keep saying the Royals got worse in the offseason but I just don’t see it. Morales and Rios are both upgrades. Shields is gone, but Danny Duffy and Yordano Ventura both have the potential to match his production. Plus they have three of the most sustainable strengths to their advantage: bullpen, defense and speed. I believe in this team, but I wouldn’t be shocked to see the Indians and Royals swap spots. I also wouldn’t be surprised to see the Tigers absolutely tank and finish 4th. I’m not going to make the mistake of picking against Oakland two years in a row. The A’s blew up their entire team and look like they’re probably going to win the Cactus League this year too, whatever that’s good for (absolutely nothing). The Angels and Mariners are both really good though and it’s hard to pick one of the three to miss. The Mariners just missed the playoffs last year. If they can stay healthy, I think they’ll run away with this division in 2015. The Angels will likely regress slightly and should still contend, but I think they’ll end up on the outside looking in. Houston will continue to improve – they appear to be trying out the Royals model of success in bolstering up their bullpen. The Rangers are going to be bad. While the American League has all sorts of intrigue, the National League is a joke. Washington is going to run away with this division. They were already the best, and then they added Max Scherzer. The Marlins and Mets are both no slouch, but the Nats could win 100 games this year. The Marlins added Dee Gordon, Michael Morse and Mat Latos. They extended Giancarlos Stanton and get Jose Fernandez back from injury. The Mets get their ace back too in Matt Harvey. Plus both teams get 18 games against the Phillies and the Braves which ought to inflate their records a bit. They’ll be in the mix come September. As has become the norm, this division race will be good, but the Cardinals will eventually pull away and the Pirates will separate themselves form the rest. The Cubs obviously got much better with the acquisition of Jon Lester, and if they can get their prospect trio – Kris Bryant, Jorge Solar and Javier Baez – into the majors sooner than later, they could manage to make a push in the second half. But I do think 2016 is their year to return to the playoffs. The Dodgers are only going to be better from last year. They added Jimmy Rollins and dropped Matt Kemp. Clayton Kershaw is the best pitcher and best player in baseball, in my opinion. You can talk about Trout all you want, but Kershaw has the power to completely dominate a game. The Padres added Justin Upton, Kemp, and former Royal and Ray, Wil Myers. Their biggest addition is James Shields. Their bullpen is dominant too. They could do some damage, but I see them finishing as the first team out. The Giants got much worse this offseason with the loss of Panda, and with the injury to Pence. Plus, Madison Bumgarner is super overrated. The Rockies and D-Backs are…not great. Every history of the Mets begins with westward expansion. In 1957, there were 3 MLB clubs in New York: the Yankees, Giants and Brooklyn Dodgers. Then in 1958, only the Yankees were left as the Giants and Dodgers left for California. Giants and Dodgers fans were without a team for 4 years, and the New York Metropolitans were supposed to be the answer when they began in 1962. In 1962, the Dodgers won 102 games in LA but finished second in the NL to the Giants who won 103 games. The Yankees took the AL with 97 games and won the World Series over the Giants in 7 games. The Mets, in their inaugural year, lost a miserable 120 games. There’s never been a worse record since. What made it even worse: they were playing in the New York Polo Grounds, the recently abandoned home of the Giants. The team that left went to the World Series against the cross town rival Yankees. The replacement Mets put up the worst record since the 1935 Boston Braves, and the 3rd worst record ever recorded. I can only imagine how much of an eye roll the 1962 Mets were. This team was supposed to replace two powerhouse ball clubs. Instead…what an embarrassment. They moved from Washington Heights in Upper Manhattan to Queens in 1965, and still piddled around in the bottom of the standings until 1969 when somehow, by some stroke of luck, they actually managed to win it all. The Miracle Mets had won their first World Series championship. They won their only other ring in 1986. The Mets roster that year was extremely impressive: Daryl Strawberry, Keith Hernandez, Mookie Wilson, Gary Carter, George Foster, Lenny Dykstra, and Dwight Gooden holding down the pitching staff. But it still took one of the biggest blunders in baseball history for them to win it all. At Citi, they even call it the “Jackie Robinson Rotunda.” The interior is packed with Jackie and Branch Rickey quotes and video clips. It’s cool, but somewhat awkward since the Dodgers still exist. In fact, the Mets colors – blue and orange – are a blending of the Dodgers and Giants colors. Karlie and I were at the game last night together and she made the comment that the Mets feel “generic”. Their mascot is a man with a baseball for a head – same as Cincinnati. Their colors are copied from past teams. 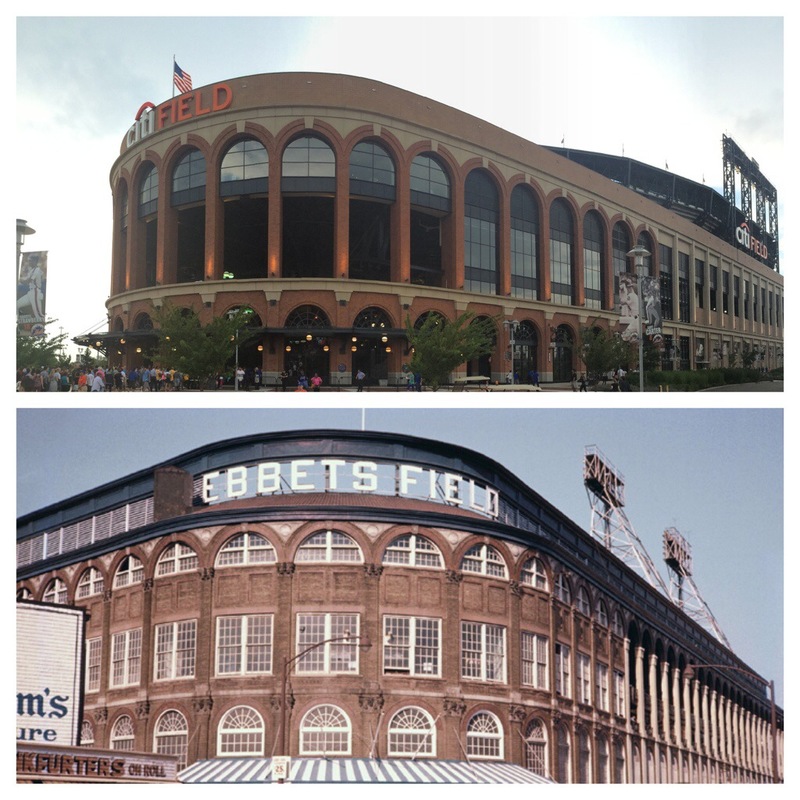 Their ballpark is copied too. They share a city – their team name is the “Metropolitans” which was supposed to unite both former fan bases into one. They serve “Brooklyn Lager” and don’t even have a hot dog named after their mascot. C’mon guys. Find an identity. They just don’t seem to have much that is uniquely theirs. In fact, the Queens fan base isn’t even uniquely theirs…at all. In a map released recently by Facebook and featured in the NY Times, it was discovered that the “Yankees are the preferred team everywhere in New York City.” Even the area surrounding the ballpark has more Yankees fans than Mets fans. The fan reclamation movement of the 1960s seems to have failed. Even Jay-Z, a Brooklyn boy, is a huge Yankees fan. The last time the Mets made the World Series was 2000, and they had to play the Yankees. The Subway Series (which I learned yesterday is technically the 7 train between Manhattan and Flushing) was won by the Yankees and they celebrated on field at Shea Stadium in front of probably more Yankees than Mets fans. Sigh. It almost starts making you feel sorry for the Mets. So much baggage with their franchise. Feeling the pressure of two historic franchises that came before them, yet playing in the shadow of their big brother in the Bronx. It’s not a successful setup. It’s like they were born into a broken family system. Family systems are so interesting to me. We inherit the system we are born into – the emotional strains, abuse and disease histories, dysfunction, abandonment, birth order, emotional distancing, employment history, marital conflict, etc. – and none of it is in our control at birth. Life is a complex web of overlapping human relationships that all impact one another. The key to healthily navigating broken family systems is managing to differentiate yourself from the emotional system. Every single one of us is born into a different system and our task is to learn to navigate it healthily. Discovering your own identity is crucial to navigating life emotionally healthy. And the Mets don’t seem to have their own identity. Murray Bowen was the pioneer behind Family Systems Theory. I encourage everyone to go check it out more in depth. I’m excited to look into this connection more as I write this chapter of the book. We talk about this stuff all the time in our seminary classes and ministry spheres. Probably more to talk about, but for now, I’m going to move on to some game notes. I’m halfway to Philly right now and need to start researching where I’m going to watch the USA/Germany match. Moving on. I’ve reached the halfway point on the tour: Game 15 of 30. But I’ve now only seen the home team win 1/3 of the time. I saw the Royals and Cardinals win their home openers. I saw Atlanta win the first stop on my Smorgasbord Tour in early April. And I saw both Oakland and the Giants win while I was in the Bay Area. After last night, I can add the Mets to the ever expanding list of teams I’ve watched lose this year: Reds, Rangers, Astros, D-Backs, Padres, Dodgers, Mariners, Rockies, Angels, and Mets. Tuesday night, the Mets pounded the A’s 10-1. New York had won 3 straight. But then I came to town and had to wreck their mojo. Last night’s game marked the third time I’ve seen Oakland win this season, and my wife, who has been with me for all three matchups, is basically an A’s fan at this point. Yoenis Cespedes is her boy. The Mets’ Zach Wheeler was coming off the best start of his career shutting out Miami last week, but he didn’t have it last night. A Brandon Moss HR made it 2-0 after 1, and a string of walks and singles scored another before Cespedes doubled with the bases loaded to make it 6-0 after 2. And that was Wheelers night. They pinch hit for him in the bottom half of the second: 2 IP, 6 H, 6 ER. The A’s would add two more before the Mets could do anything offensively. Coco Crisp hit a solo HR and the Mets conceded another run on a double play. 8-0 after 6. Then the Mets started to mount a comeback: Lucas Duda hit a 3 run shot in the 7th that made it 8-3 and caused the “big apple” beyond the CF wall to spring to life. Every Mets HR causes the apple to rise up from behind the wall. It’s a pretty stupid stadium gimmick. We saw it again in the 8th when Chris Young homered and made it 8-5. But that’s all the runs Oakland would allow. Sean Doolittle, the A’s closer and a terrific follow on Twitter, struck out the side in the 9th to end it. Fifteen down. Fifteen to go. It’s time for Dodger baseball. The West Coast Tour begins at Chavez Ravine in a contest between the two teams that first brought baseball to the left coast in the 1950s: the San Francisco Giants and the Los Angeles Dodgers. It’s a rivalry going back 130 years and 3,000 miles. The New York Giants and the Brooklyn Dodgers were cross-town rivals for two decades before the Orioles left Baltimore for the Bronx in 1903 to eventually become the Yankees. For 35 years, the three teams split the Big Apple into three strong and proud fan bases – especially in Brooklyn. But in 1958, westward expansion caused MLB owners to dream of new vistas as well and the Giants and Dodgers – to the shock and chagrin of their passionate fans – bolted from their busy neighborhoods for SF and LA. When the Dodgers first landed in LA, they played at Los Angeles Memorial Coliseum for four years and promptly winning the World Series in 1959 thanks to one of the best 1-2 starting pitcher combos to ever play the game: Sandy Koufax and Don Drysdale. In the 1940s, there was a low income development proposed for an area just north of downtown Los Angeles. It was populated by a few poor Mexican-American communities who, in ethically questionable fashion, were forced to leave the area so the city could expand into the hills surrounding the burgeoning city. After the housing development fell through, Dodgers owner, Walter O’Malley, purchased the land as the new site for his ball club. * – Some baseball fan from Colorado is fidgeting wanting to make a “mile high” reference. I see you, Rockies. But you’re not on a hill, and that’s my point here. It is the oldest ballpark in the MLB not named Wrigley or Fenway, and it survives as the only unmodified ballpark of its generation (along with Oakland…but we’ll save that compare/contrast conversation for Sunday). The only bummer about Dodger Stadium: traffic. Oh my. Now I’m from Kansas City, which is one of the most vehicle-accessible cities in the nation, so the traffic in Los Angeles is something I flat out don’t understand. How do they not have a better public transit situation? Where the heck is everyone going? Is there any time of day when the roads aren’t completely congested? 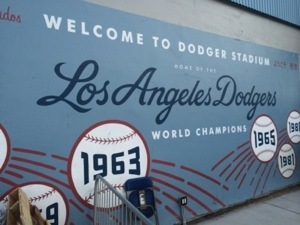 Our trip to the ball park was from UCLA to Chavez Ravine. Which is __ miles according to Google Maps. It took us well over an hour to get there. I’ll never complain about my 15 minute drive out to Kauffman Stadium again. The crazy traffic causes a slightly transient attendance too. About half (no exaggeration) the ballpark arrives late and leave early. It’s a nightmare. Granted, we were seeing the home team take on a hated division rival, but still, it’s a Thursday. Announced attendance was 43,068. It was Inflatable Chair Night last night. 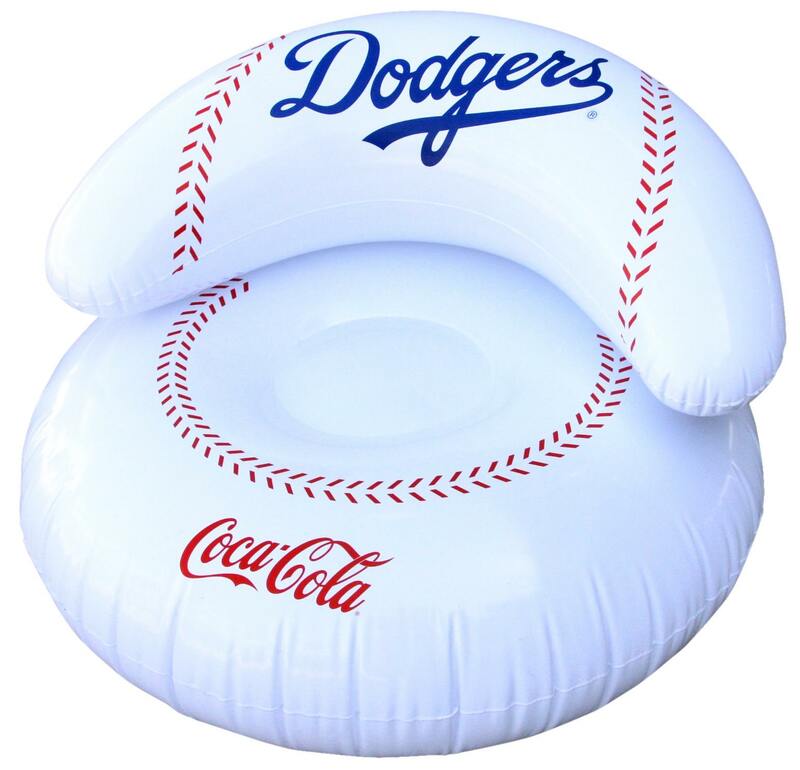 Which, as you might expect, turned into a somewhat poor decision on the part of the Dodgers’ marketing department as dozens of chairs became beach balls and started bouncing around the stands. In the 1970s, when Bill Veeck was the GM of the Chicago White Sox, he was always trying to came up with goofy gimmicks to draw more people into the game. The players wore shorts as their uniform for part of a season. He hired a midget to play for his team once to make the strike zone smaller. But his best blunder was Disco Night at Comiskey Park – they gave away EP records to all the fans, and all the records turned into frisbees launched around the ballpark and all over the field. They had to cancel the game halfway through for safety concerns. This wasn’t as bad as that. But how didn’t they see this coming? One older gentleman near me with headphones on was NOT amused by the crowd’s antics. He was all business and kept his arms crossed clearly fuming over all the action. As I looked around, I noticed quite a few Dodgers fans sporting the headphones/earbuds. The reason is an obvious one: Vin Scully. Vincent Edward Scully got his start into professional broadcasting when Red Barber hired him to do radio broadcasts for CBS in the late 40’s. The story goes that Vin was broadcasting a Red Sox game on a freezing cold day at Fenway. There wasn’t a press box for him to call from, so he called the game the roof. And since he had planned on being in the box, he hadn’t brought a coat or gloves either. Yet he never once mentioned being so cold on the air. Red Barber, who called the Brooklyn Dodgers games back then, was so impressed that he tabbed young Vin to be his successor as the voice of the Dodgers when they made the move out west. Vin has been with the team ever since. To many, myself included, Vin Scully’s voice is baseball. It’s smooth and rich, insightful and clever, and baseball fans across the nation turn on Vin’s call of a late night Dodgers game after their own team’s game has concluded back East. Vin’s voice is pumped into the concourses of Dodger Stadium throughout the game, which actually makes the concessions and gift shops a little less rowdy while listening to his soothing call. Speaking of concessions. I wasn’t there for more than 5 minutes before getting a Dodger Dog in my mouth. It felt a bit overhyped to me, but it was delicious none-the-less. I added mustard, onions and ketchup, and dripped a giant glob on my jacket around bite number 4. I paired it with a Dos Equis, which felt appropriate considering the past and present Latino culture around Chavez Ravine. The Dodgers are an impressive franchise. Six time World Series champs, 8 Cy Young pitchers in 11 Different seasons, plus 12 Rookie of the Year awards. Names like Jackie Robinson & Branch Rickey, Koufax & Drysdale, Kirk Gibson, Fernando Valenzuela, Gil Hodges, Roy Campanella, Pee Wee Reese, Duke Snider, Tommy Lasorda, and Vin Scully are legendary in Dodger history. And today the team – with the financial help of Magic Johnson and others – has one of the better (and most expensive) lineups and pitching rotations in the MLB. What intrigues me most about this team – and this Giants /Dodgers matchup – is the struggle that took place back east after the teams skipped town in ’58. Suddenly, the teams that had been foundational for the game and had created passionate fan-bases in NY, had lost their identity overnight. Now what do we do? Who do we root for? How do we follow a team that’s suddenly 3.000 miles away? Try to follow your baseball soul from across the country. 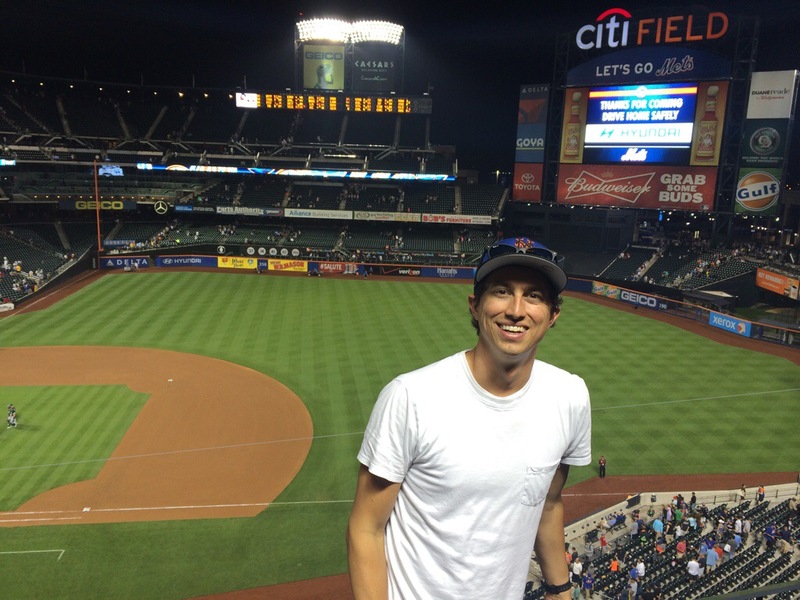 Quit on baseball for a decade until the Mets show up. None of which are quality options, but those were the choices New Yorkers were stuck with. I wonder how this translates into how we react when our life, our relationships, our job, or our faith gets tough. Do we abandon our beliefs or our communities when we are abandoned? What happens to our commitments when those we’re committed to don’t return their loyalty*? Our options are fight, flight or freeze. Which is what Brooklyn and New York fans were presented with as well. Fight the move and keep trying to follow the team from a distance. Run away from the pain and become a Yankees fan instead. Or freeze for a decade in hopes that someday a successful franchise (or the Mets) will once again be in their midst. Personally I’m a runner. If something gets too painful or difficult, my gut tells me to move on to something else more fun or exciting. On the positive side, I’m always seeking new adventures, but on the negative, I often don’t give those experiences enough time to sink in and transform me. I can sometimes be a mile wide and an inch deep, as the saying goes, and it takes intentionality and effort on my part to dig deeper into things to extract meaning. It’s more painful that way, sure, and it would be way easier to move on to something new (read: tonight’s game in Seattle! ), but sitting in the moment longer allows transformation and depth to transform me. Or maybe it’s a divorce or a friendship turned sour that makes us face these options. Which is your gut move? Do you have one? Perhaps there’s a bonus option of simply sitting in the pain instead of running, fighting or being paralyzed by it. What happens when we acknowledge pain and allow it to sit with us for a time? Can that bring about transformation? Is that beneficial? I was chatting with my friend, Tim, about this just a couple days ago. He and I are similar in that we seek new experiences and run from pain. He said some faint brilliant: “When we run from pain, we are afraid. But when we stop running and let our pain “catch” up to us, we are no longer afraid.” Isn’t that great? Instead, we’re growing, learning and maturing. We are being transformed into something new. I’d love to get some insights on this from some old school Brooklyn fans about this experience and how they dealt with the struggle. How does one align themselves after being abandoned like that? Very interesting stuff. Excited to explore this more in depth later. For now, on to the game notes. Starting pitching was terrific both ways in this one. Ryan Vogelsong went 7.1 innings, 5 hits, 1 run for the Gigantes. He was perfect through 3.1 innings until Puig broke it up with a hard grounder to Brandon Crawford’s left. Crawford got a glove on it, but couldn’t make the play. I’d’ve given him an E6, but the home scorekeeper gave Puig the hit. Josh Beckett was just as solid going 6.2 innings, 5 hits, 1 run. Beckett walked a few early, but settled down and really only made one mistake the whole evening when he hung a curve to Brandon Hicks who hit it over the 360′ sign in left field. It’s a bummer when games like this are decided on something lame. Last night the Dodgers bullpen walked the bases loaded with J.P. Howell and Jamey Wright pitching. Giants scored two on a sac fly and a single to break the tie and take the game 3-1. Also, it’s important that I mention that I did purchase a Dodgers foam finger. Nine Down. Twenty-one to go. The tour began in Cincinnati for the Opening Day. Then it came home to Kansas City and over to St. Louis for the home openers in the two ballparks where I feel home. Then the tour took me east to west across the southern part of the country for what I called The Smorgasbord Tour: Atlanta, Arlington, Houston, Arizona and San Diego. Exploring each of these ballparks, talking with the fan base, experiencing the traditions and taking in the the atmosphere, have sparked some significant conversations and with each visit, I find that the book I am working on is slowly being framed in new ways. Opening Day was so full of hope; visiting my “home” ballparks was an exercise in self-discovery which then spilled over into Atlanta, Arlington and Houston. Arizona sparked the the concept of conversion, and the green space in San Diego began planting thoughts of creation and Creator, gardens and Gardener. Tomorrow evening, my wife and I depart for Los Angeles, then on to Seattle, Oakland and San Francisco. * – Originally, I had the Angels on my list for tomorrow night, but a flight mix up is getting me to Los Angeles a few hours later than I had planned. Thankfully, my sister-in-law graduates from UCLA in mid-June and I’ll be back in the area to catch the Halos then. Phew. Lots to love in this lineup. First of all, and this is no offense to those I’ve already visited, but I think the ballparks are about to up their game immensely. 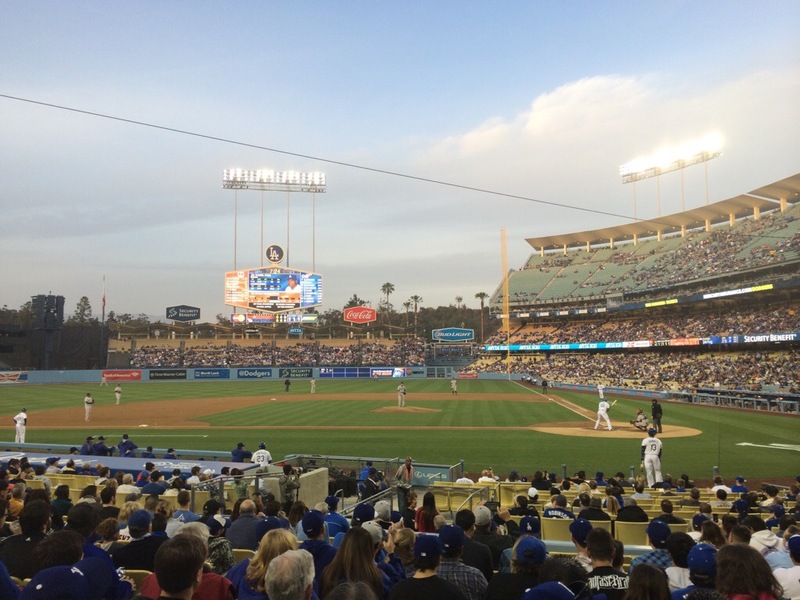 Dodger Stadium is the oldest ballpark not named Wrigley or Fenway. Safeco Field is one of the more intriguing destinations. The roof is so unique, and Seattle just feels so far away. I got to walk through AT&T park a couple winters ago. It was actually set up for a NCAA bowl game. 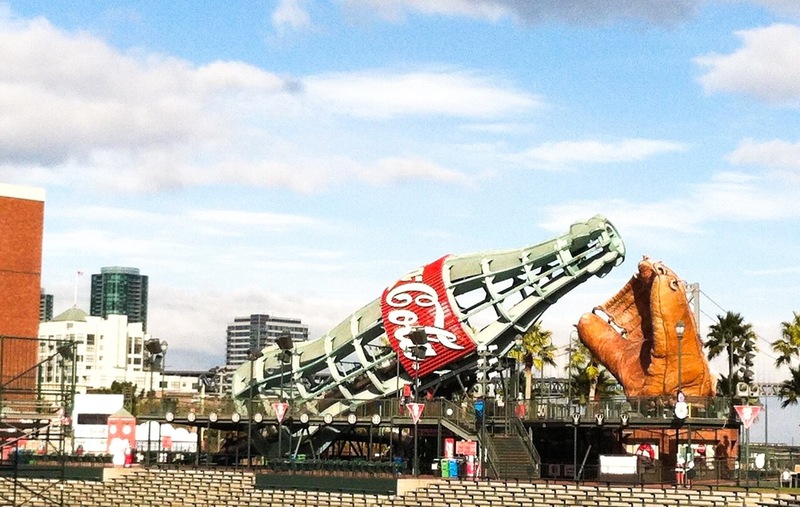 Gorgeous views of the Bay Bridge and Treasure Island, and the Coke bottle and giant glove beyond left field have served as my Facebook banner ever since (image above). O.Co Coliseum is widely understood to be the worst ballpark in the MLB. The sewers backup in the locker rooms a few times a season. It’s one of the last football-convertible ballparks around, and the giant moveable grandstands in center field – known as Mount Davis, named after the late Raiders’ owner Al Davis – is a complete eye sore. The foul territory is enormous and pretty much anywhere you sit places you way too far away from the action. However, I’m excited to see Sonny Gray in person. He was just tabbed as the AL Pitcher of the Month for April. He’s 4-1 with a 1.76 ERA so far this season. If the same Nationals team shows up in Oakland that did (or didn’t) in Atlanta, it should be a fun game to cheer for the home team. I get to see the Royals play again. This time in Seattle and this time it’s Vargas instead if Ventura. Bummed it’s not King Felix too. Can’t win em all. When Clayton Kershaw was making his comeback from injury, it started to look like he was going to get his first start back around this week. Instead, it’s tonight, and we’ll see Josh Beckett instead against Vogelsong. Still should be a solid matchup, but honestly, the mystique and excitement of seeing a game at the Chavez Ravine makes the game itself less crucial. However, If Yasiel Puig isn’t back from his encounter with the outfield wall by Thursday, I’ll be pretty bummed. Finally, the marquee matchup of this week: Aaron Harang versus Tim Lincecum. Harang has been phenomenal – he threw 6 innings, 5 hits, 1 run when I saw him in ATL. Lincecum, a two-time Cy Young winner, hasn’t been great yet this year, and it’s probably his haircut that’s the issue. Really excited about this one. Get ready for another series of ballpark posts from out west…and probably prepare for some late night ball game live-tweeting too.